New cyber risks and threats are emerging at a pace faster than ever before. - Which risks can be managed through cyber insurance? 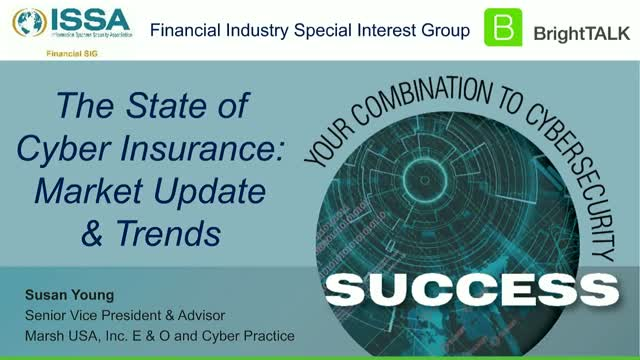 We’ll address these questions – and dig a bit deeper into the state of the cyber insurance market and the role of cyber insurance in your overall cyber risk management strategy. Cyber risk can’t be eliminated – it must be managed. This webinar is brought to you in partnership with ISSA Financial Industry Special Interest Group. national Cyber & E&O Practice (part of Marsh’s Financial & Professional Liability Practice, FINPRO) in the Seattle office. She is primarily focused on cyber /security & privacy risk, media liability, and technology errors and omissions.